Sakai Community DocumentationSakai 11 - EnglishSakai 11 Administrator Guide Sitestats AdminHow do I create predefined reports available throughout the system? Enter a Title and Description for your report. Choose What to report on. This option allows to configure the type of activity to report. You can choose to report on Visits, Events, or Resources. Choose When to report on. This option allows to configure the time period to report. Choose Who to report on. This option allows to configure the users to report. Choose How to display the report. This option allows to configure how the report will be presented. 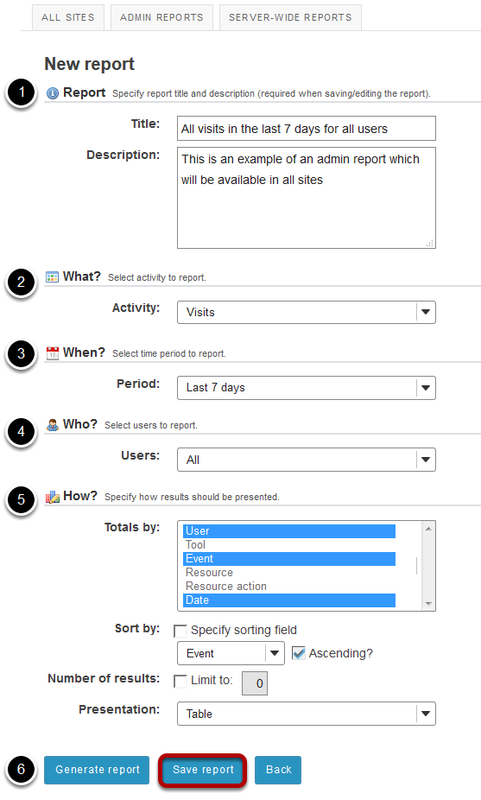 Totals by: Defines how to group report data (eg, selecting "User" + "Date" will present a report grouped by user and date). Multiple fields can be selected pressing the CTRL (for disjoint selection) or ALT (for range selection) keys while clicking with the mouse. This report will now appear within the Statistics tool for all sites on the system. Individual users may run it within their own sites if they choose. Prev: How do I view reports for a specific site? 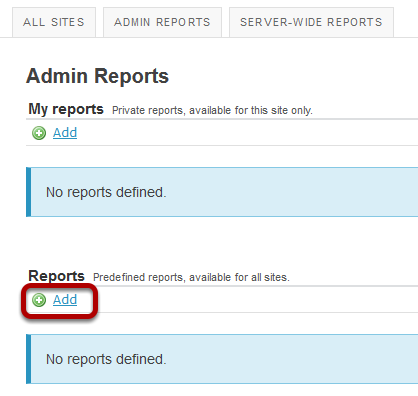 Next: How do I view server-wide reports?